The 13th Station of Light is from Acts 1:14: "All these were constantly devoting themselves to prayer, together with certain women, including Mary the mother of Jesus, as well as his brothers." Sometimes our picture of Mary is frozen in time, witnessing the crucifixion and death of Jesus. Remember how, from the first, Mary chose faith: "Let it be with me according to your word." Luke 1:38 Now, after Jesus' crucifixion and burial, Mary is seen once again following the word to "stay here in the city" until the coming of the Spirit. Mary is joined with her remaining sons and the disciples, waiting in the upper room. Waiting for the Lord is about trusting God. In part, its spiritual discipline is unlcuttering, a faithful action of letting go of our attachments, the root of which means to be "staked to." Worry and anxiety require us to buy into, to choose to believe, at least two lies: (1) I can control the outcome of things and (2) I can keep bad things from happening if I worry hard and long enough. The Gospel invites us to let go of the need to control either by our thoughts or actions and to try trusting God instead. The promise, from Isaiah 40, is that, in waiting, we will renew our strength. But it's the grasping and clutching hand that siphons our reserves and saps our energy. In this station, the Upper Room that precedes Jesus passion and death is remembered. In that first place, we're confronted with the evil that is within us. We discover that, far from our words which speak of faithfulness and loyalty, we choose the easy way out- that of deserting and , if necessary, betraying even our best friends. We learn that we're capable of anything. But here, in #13, the Upper Room becomes a place where disciples choose light, faith, and hope. All you have to do is to read Revelation to know that one of the highest virtues for the first generations of Christians was faithful waiting and patient endurance. 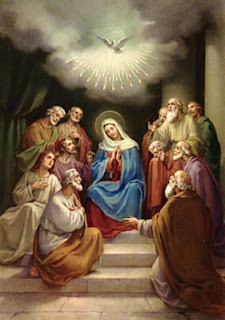 The example for disciples this Easter season is Mary, Jesus' mother, who continues to wait with us, for the Holy Spirit, in all the upper rooms of our lives.